Went above freezing at 2:13 p.m. today ending our below 32° streak at 65 hours and 25 minutes! We went below freezing at 8:48 p.m. on January 14th and are just a few degrees below freezing at just after 12 noon today. That is nearly 64 hours of temperatures less than 32°....ponds are frozen, the ground is hard, and vehicles are...well...acting funny. The odd thing is this: You just get used to the cold temperatures. Looking at our current conditions, we've had wind gusts (out of the SSW) to 20 mph today. This makes wind chills (or feels like) in the teens. With no sunshine this afternoon, it won't feel so warm. 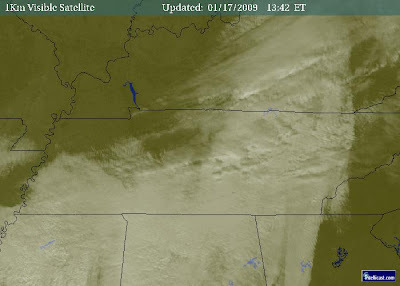 All of Middle TN and most of West TN are cloudy. Temperatures are really going to struggle to reach freezing this afternoon. They will, however, be steady tonight as precipitation moves in. Looks like a rain/snow mix. Michael - We ended up with 58-59 hours of sub-freezing temp here in Memphis and suburbs. Today is a regular heat spell - it's up to 42! I'm glad that streak is behind us. We're still under a cloudy sky. The south winds are trying to bring in some warmer air, but it isn't happening too quick. Crossville was still just 24° at last hour.